Accepted: Congratulations on your upcoming graduation from medical school! How do you feel to be saying goodbye to your studies and putting on your white coat? Jasmine: Thank you so much! To say that I am elated doesn’t even scratch the surface as to how happy and thankful I am to finally graduate. It is bittersweet for sure because I have made some wonderful friends in medical school and soon we will all be parting ways, but there is so much excitement and anticipation as this next chapter unfolds! The amazing thing about medicine is that it is always changing, so if I want to continue to be the best doctor I can be, I will always be a “student” in my field. That being said, I am excited to trade the all-night study sessions with overnight calls and busy nights on the labor and delivery floor. I’m so ready to be a real doctor! Accepted: Where did you match? Where will you be doing your residency? Accepted: At what point in the last four years did you know that that’s the type of medicine you wanted to practice? Jasmine: I knew that I would enjoy women’s health after the experience of having my son in college; however, I did not fully decide to pursue OBGYN until after completing the rotation during the spring of third year. I had a gut feeling that I would fall in love with the field as soon as I got the chance to fully experience it, and I did! Everyone is going to try and “sell” you their specialty when you are on the wards. Your Attending physicians all love what they do (or they wouldn’t have chosen it). So, the biggest decision that you will make during your clerkship years is “Do I want surgery vs. no surgery?” I think that that decision helps you to narrow down fields a lot. I really enjoyed the majority of my clerkships, and I loved outpatient clinic medicine, but I also loved the unique experience of being in the OR, so OBGYN was a great fit. There is so much variety and it is a lot of fun! Accepted: Can you tell us about your residency application experience? What would you say was your greatest challenge and what steps did you take to overcome that challenge? Jasmine: Sure, the residency application is an online service (ERAS) that encompasses all the programs in the country – it reminded me of the common application for college. It is composed of your USMLE transcript, medical school transcript, CV, personal statement, and letters of recommendation. The fee scale is correlated to how many programs you decide to send your application to. In mid-September, the application is open for the programs to view applicants, and within a week or two, you start getting emails inviting you to interview. It is all very exciting and moves very fast! The biggest challenge I faced during the process was choosing to continue to breastfeed during interviews. I actually ended up bringing my kids along with me for all but two of the interviews (I went on 11 total). My youngest child was 3-6 months old during the whole span of interviewing. The interview days were long, usually beginning around 8 or 9AM and ending between 1 or 2PM, which really wasn’t much longer than my days on the medicine wards right before interviewing began, so my body was prepared. Overall, things went well and I was able to successful continue breastfeeding, but it took so much planning – making sure we were staying in hotels with in-room fridges, packing adequate pumping supplies, making sure my chest looked “modest” in interview attire, etc. Oh, and I now know the protocol for transporting breast milk on an airplane, if anyone is interested…haha. 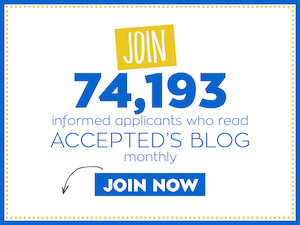 Accepted: Do you have any other residency application tips for our readers? Jasmine: During third year, if you have an attending physician that you spent a great deal of time with or someone that gave you an excellent evaluation, ask them right away for a recommendation! Most programs do not require that all of your letters come from your field, so even if you don’t know what you are going into yet, it doesn’t hurt to ask. This also gives your letter writers plenty of time to put it on their calendar; you do not want your application to be incomplete while you are waiting on letters to come in. During the interviews, try and relax! I loved my interview season experience. Although the traveling every weekend for three months straight got exhausting, it was so fun to get out of Indianapolis and meet new people. My interviewers were all very personable and I genuinely felt like they wanted to get to know me as a person – beyond my Step scores and resume – so take a deep breath, and let your light shine! Finally, this was advice that was given to me as well; write hand written thank you notes to all of your interviewers. Honestly, I don’t know if they even read them, but in a world of email, hand-written notes are such a lost art. I think the fact that you took the time to write one, makes you stand out. Accepted: What was it like spending your last year of med school pregnant and then with a newborn? How did you get anything done?? Jasmine: It was a much easier experience than I imagined it would be. Unfortunately, my surgery block was the last block of third year, so being on my feet all day at 6 months pregnant probably wasn’t the best in hindsight, but baby and I did fine! Having a newborn during fourth year was ideal because our schedule is much more flexible – we only have three required clerkships and the remainder can be whichever electives we choose. I was able to find great independent study-type electives or electives that only required 1-3 days on campus per week, which was an awesome transition for me and the new baby. The last half of fourth year has been even better because the majority of my rotations have great hours and no weekend commitments, so in addition to spending more time with my family, we have gotten to visit our extended family and friends! Fourth year = bliss. Accepted: Do you have any tips for women who are thinking about going to med school and starting a family? Jasmine: I remember when I started medical school thinking that I would be the only mom in the group, so not true! There are more parents in medical school than you think, and thankfully, as a result, curriculums have become user-friendly for this “non-traditional” demographic. If you plan to start a family during medical school, communicate with your student affairs office and talk to other parents at your school. Don’t try to reinvent the wheel and use all of your resources! Thank you Jasmine for sharing your story with us! You can read more about Jasmine’s med school adventure by checking out her blog, The Mrs. The Mommy. The M.D.